Whats better than Nutella in a jar you may ask? Well, it's Nutella cheesecake in a jar that's what! This recipe is yet another from my new favourite cookbook. 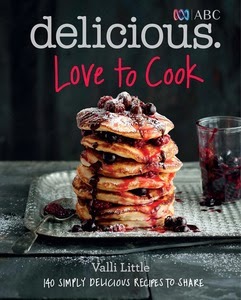 Valli Little's Love to Cook. Super simple, delectable and perfect for transporting, this cheesecake is a must for entertaining in the Summer months. Shaved dark chocolate and chopped roasted hazelnuts to serve. Using a food processor, pulse biscuits to form crumbs. Add to butter and stir to combine well, then press crumb mixture into the base of a 2 litre glass jar or bowl. Whiz up the cream cheese, Nutella, vanilla and amaretto in a food processor until smooth. Transfer to a bowl. Whisk 300ml of the cream to soft peaks, then fold into the cream cheese mixture until well combined. Spoon over the biscuit base then refrigerate for 4 hours. To serve, whisk remaining cream (200ml) into soft peaks and spoon over the top of the mixture and decorate with shaved chocolate and hazelnuts. *Alternatively, you could use smaller individual glass jars. And if it's in a jar you can carry it around in your handbag for easy snacking, right? !